Isn't she just the sweetest? I just love her. I can't wait to get my markers out and bring her to life. If you have not had a chance to visit Sassy Cheryl's, I think you should. 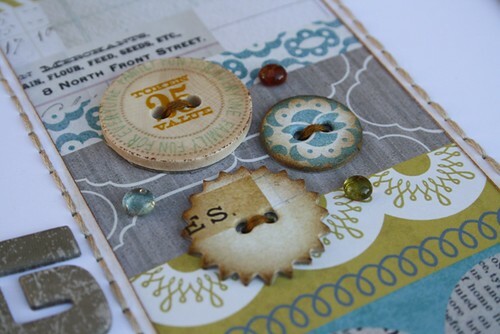 I had fun playing around with the Pretty Pockets stamp & die set from My Favourite Things. 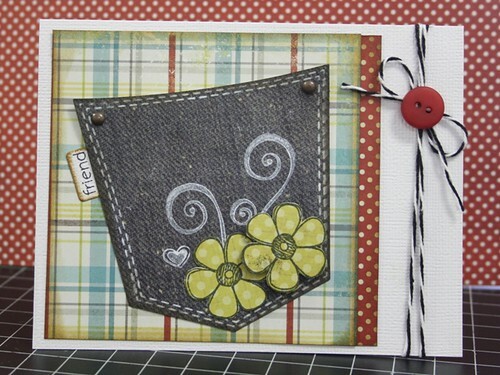 I love how it has matching stamps that co-ordinate perfectly with the pocket die. I love the pocket! You could tuck a gift card or money in the top and it would be great for a birthday! We used this card for a demo/make 'n take at the store and it was a huge success. I used white ink to stamp my stitching, flourishes and heart. 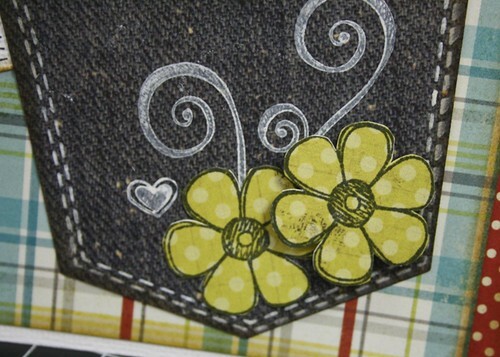 Then I stamped the flowers using black ink and cut them out and added them to the pocket with some foam dots. I love the little tab that comes with the die. 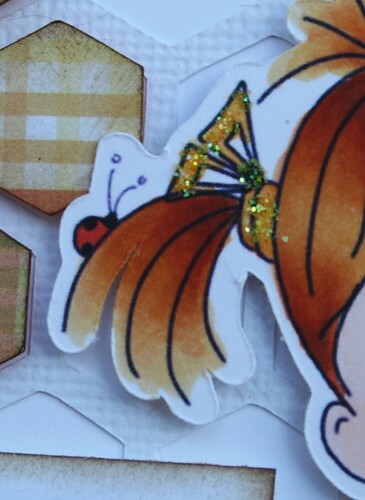 There are an assortment of little stamps to choose from that are included with the set. I will tuck this away in my stash for someone special! I set a goal for myself a while back......it was to really focus on getting the pages done for Jay's trip album. I was sort of on a roll and then it came to a screeching halt. I have so many photos to scrapbook and very little time to do it. This combination is not really working in my favour. I decided that trying to design each and every page myself was really slowing me down. I headed to Pinterest for a little inspiration. While browsing around I found this layout! 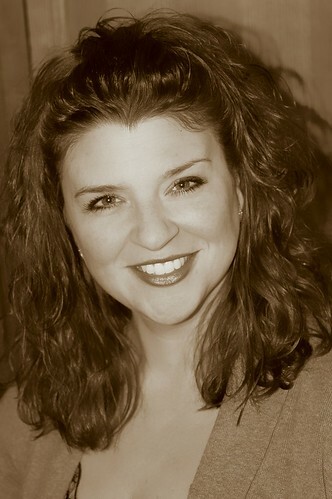 The artist of that fine design is Kinsey Wilson. Here is my version of her layout. I used one of the newest collections in our store from My Mind's Eye........The Sweetest Thing - Bluebell! The large 'T' was what really drew me in. I created it using my Silhouette. I cut the letter out of my background and then placed a piece of pattern paper on the back to cover up the hole. Then I poked holes around the outside (on the white background) and hand-stitched around the letter. Brilliant, huh? 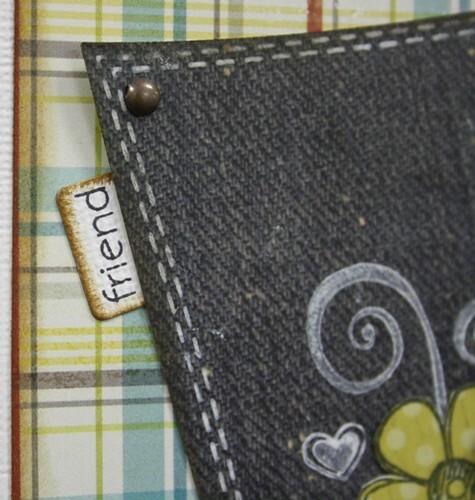 I cut this word right out of the pattern paper that I was using and used it as an embellishment. I added some Dew Drops for added interest. These buttons are part of the collection. I chose the patterns that worked best with my layout and then stitched them to my background. A few more Dew Drops tied it all together. There are some awesome stickers that go with this collection and one of them happened to have the 'adventure' phrase on it.......everything about this trip was an adventure. I had to use it. 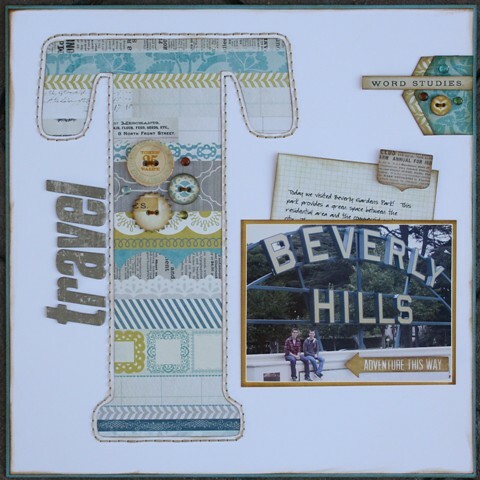 I added some chipboard letters to spell the word 'travel' and create my title. I placed my journaling behind my photo with a sticker for the tab to pull it up and down. I used my favourite font (Baby Boston) and printed it on one of the coordinating papers. I have to say that it was really nice to 'borrow' and idea from someone and make it my own. I think I will try this again really soon. Hello Card - The Cutting Cafe! Ack, I am so excited to finally be able to post this! I broke out my Copic markers this past week and I coloured this awesome image from Sassy Cheryl's Digis. You can check out my post on that here! 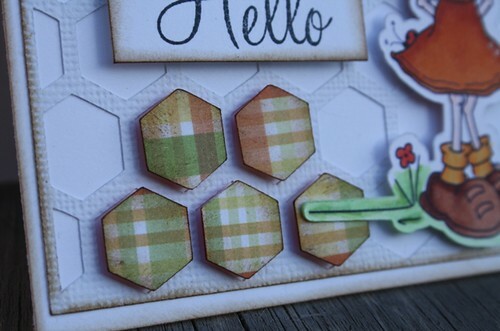 I combined my image with an awesome card base that I created with the Hexagon Shaped Card file from The Cutting Cafe! 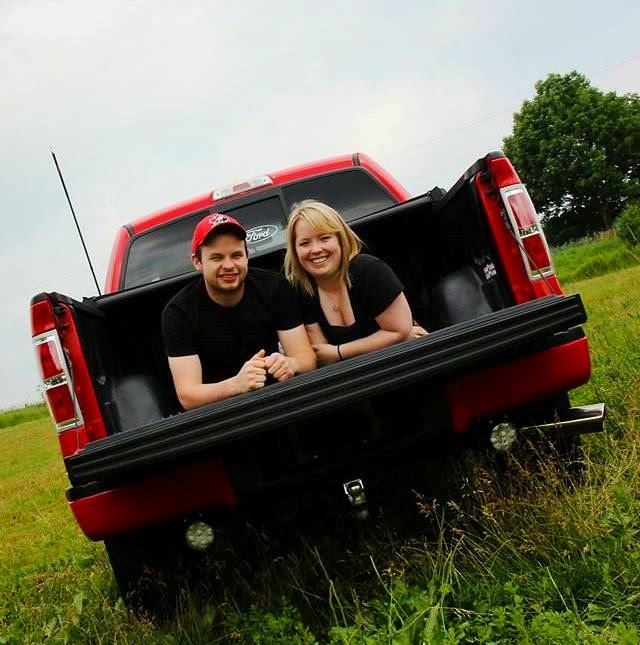 The end result just has me giddy! I loaded this background into my Silhouette and sized it to fit perfectly on the front of my card. 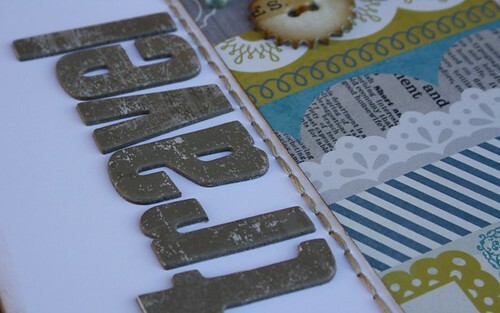 I cut it out in white cardstock and then again in the patterned paper. I filled in the spaces on the white background with the centers from the pattern paper. I love the end result. I am super excited to see what the other team members have created with these trendy hexagons. Be sure to stop by The Cutting Cafe Blog and check it out. The post will be up sometime today. I am so fortunate to have a Copic stash that is filled with a rainbow of colours. 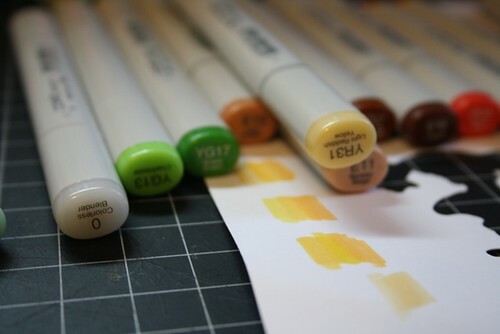 I have popped the cap off a few of these markers, but I really haven't used very much ink! 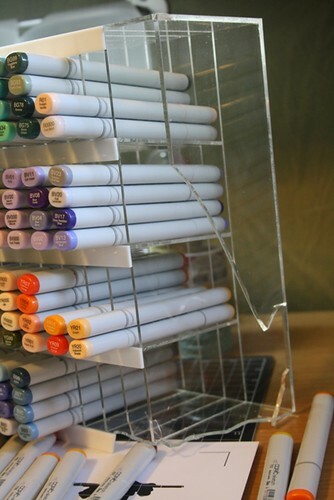 We have beautiful display units at our store that contain all the markers for sale. When we ordered the acrylic shelves, one of them arrived and it was smashed. We had it replaced and put this one in our storage room. A while back, I was organizing my craft room and remembered seeing the smashed shelf and decided I would put it to use. 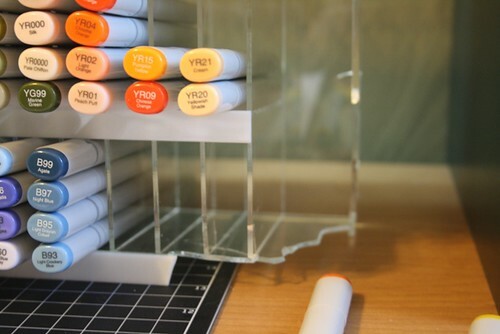 The banged up corner does not really bother me and it holds my markers nicely, so I can see all the colours and keep them in order. 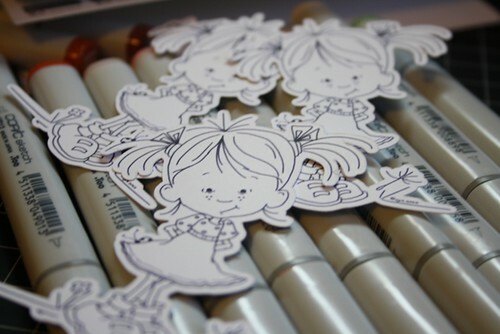 Through Pinterest, I found Sassy Cheryl's Digi Stamps and immediately fell in love with the images. This happens often and I never really bother purchasing anything because I know I will be disappointed in my colouring skills and won't like the end result......therefore it will be money waisted. Last night, I took the plunge and purchased Sweet Little Avery! I imported the image into my Silhouette and used the 'print & cut' feature and ended up with 4 of these lovely printed images. I figured I would need 4 of them for practice. There was a sample of the image already coloured on Sassy Cheryl's website, so I used that as a guide for choosing my colours. 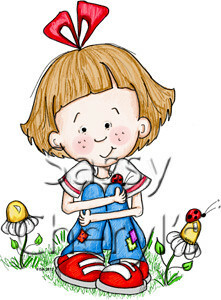 And here is Sweet Little Avery......brought to life. I am so impressed with myself! 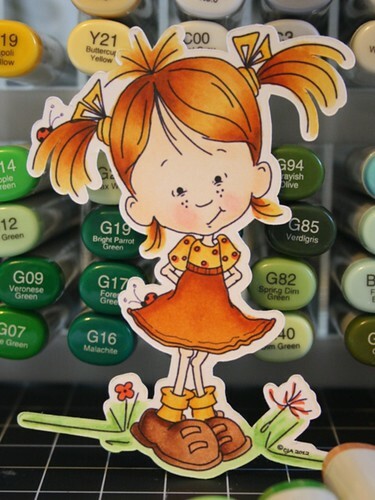 I have been watching Joanne colour and have picked up a few tips from her. Clearly, I was paying attention. It is not perfect and I still have lots to learn. I already know what I am going to do with Avery. She is way to cute to just leave her standing on my craft table. It is raining again.......that is all it has done for the last week. I know we need it, but I am in the mood for some sunshine again......something to make me smile! 'Back to school' is right around the corner and this week The Cutting Cafe is sharing projects using some great files that are perfect for back to school projects. I used the Apple Treat Box & the All About School Printable Stamp Set! 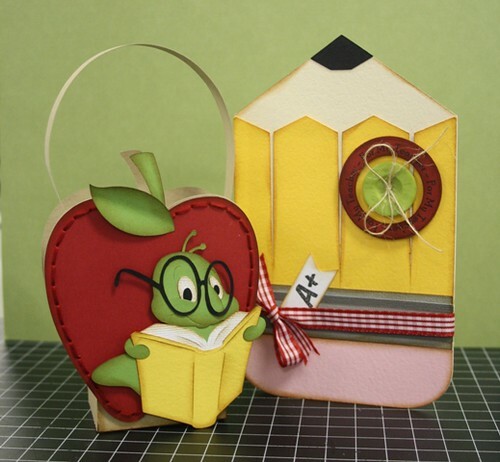 The Apple Treat Box makes this adorable apple shaped box. I added some red stitching to give the apple some texture as well as inking the edges with my Vintage Photo Distress Ink. 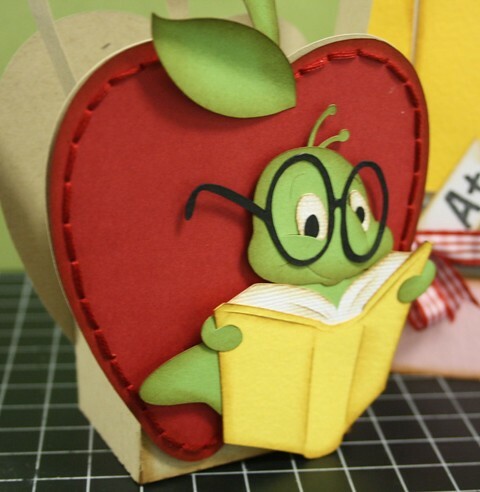 I added this adorable 'bookworm' from the Silhouette Online Store by Sarah Bailey! 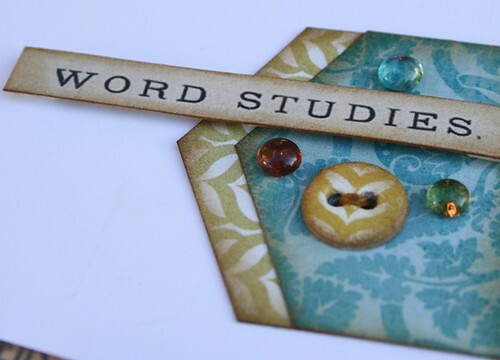 I printed this circle image from the All About School printable set and punched it out using my circle punches. I added a button to the center and tied some twine into a bow. The pencil card is also a file from the Silhouette Online store by Snapdragon Snippets. 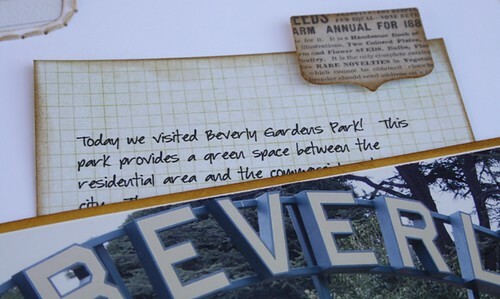 I hope you will visit The Cutting Cafe blog and see what the other team members have created. I have been buried in books lately and I have read so many good ones over the past few weeks. 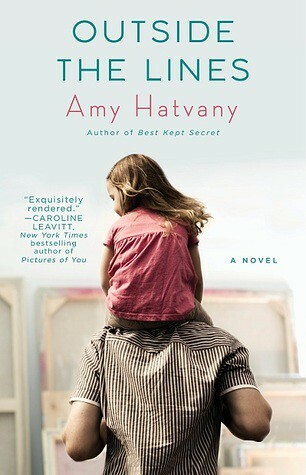 I am super excited to tell you about my latest find......Outside the Lines by Amy Hatvany! 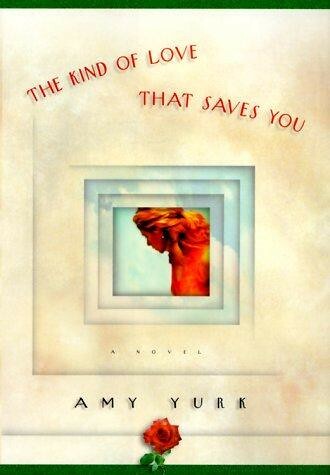 This is a new author for me and I really enjoyed this book. I am not sure where I discovered this one, but it was on my 'must read' list. 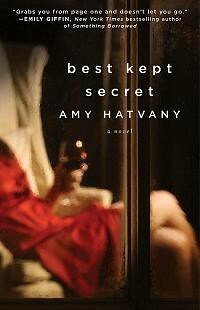 I downloaded a free preview on my Kobo app for my iPad and was hooked after just a few chapters. You can read the synopsis of the book here! I like books that leave me with something I didn't have when I started reading it. I don't want to give too much away, but I certainly see a different side to mental illness and homelessness. This is a beautiful story! 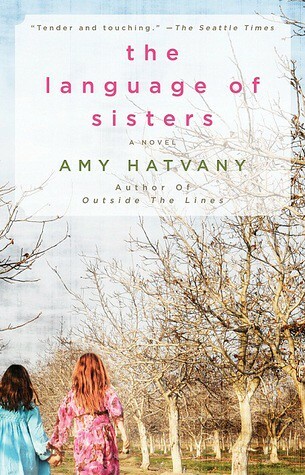 I was thrilled to find out that Amy has written other books. I have added them to my 'must read' list too. They all sound like great reads. If you have read any of these, I would love to hear what you thought. Happy reading everyone! Hello friends! 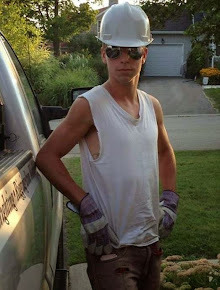 I am home from a fun filled week at the cottage and am happy to be digging into my supplies again. I will be doing some posts about our holidays very soon.......we did have some awesome adventures. 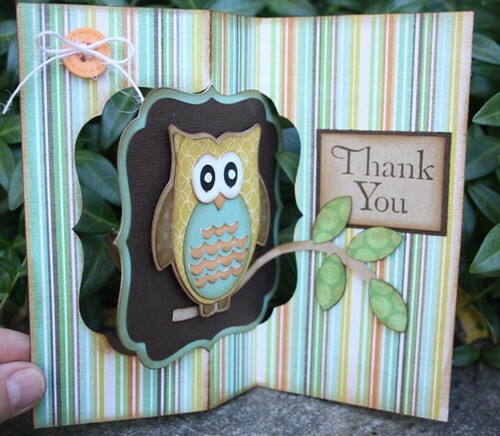 Today I am happy to show you a card that I made using the Owl Shaped Card from The Cutting Cafe! 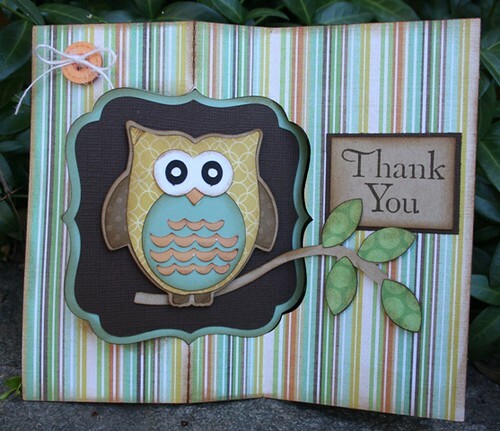 I love owls, so this was exciting to work with. 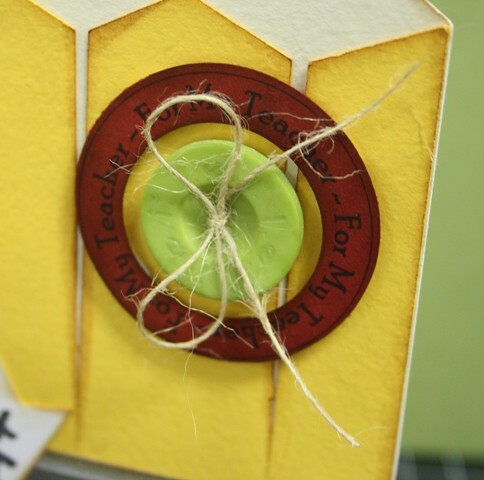 I decided to make a 3D swing flip card using a file designed by Lori Whitlock! I downloaded it from Silhouette and used it as the base of my design. 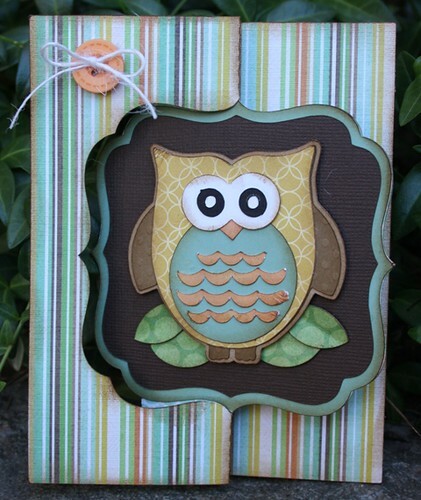 This little owl was so much fun to put together. I love all the detail that it has and how dimensional it looks. Here is an action shot of the card. When you open it up, the center swings and flips to the other side to reveal a second owl and the tree branch, which is also included in the file from The Cutting Cafe. Isn't it cool? I think so. 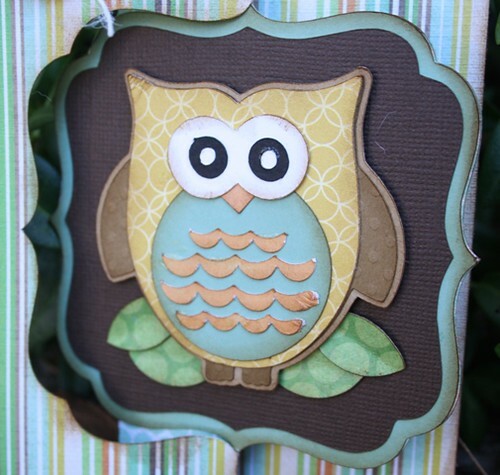 Be sure to visit The Cutting Cafe Blog and check out what the rest of the team makes using this awesome owl! The post will be up on their blog sometime today.